SCOTTISH tourism received a major St Andrew’s day boost today, 30 November 2011, with the launch of one of the most technologically-advanced tourism apps in Europe, Welcome to Scotland. The new app uses augmented reality, pointing technology, GPS and interactive maps to deliver detailed information on just about anything the visitor might want to know. Based on Landmark Press’s successful Welcome to Scotland website (www.welcometoscotland.com) the app also features many exceptional special offers. 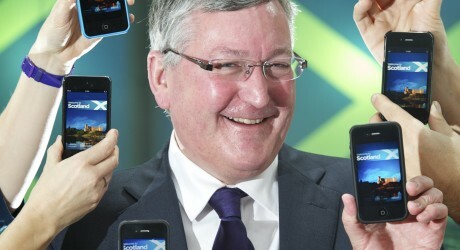 Launching the app at Camera Obscura in Edinburgh, Fergus Ewing, Scottish Government Minister for Energy, Enterprise and Tourism, said: “This app is an excellent way of getting the most up-to-date and relevant information to visitors, helping them make the most of their time in Scotland. “It will enhance their experience by empowering them with the knowledge they need to have an unforgettable trip. Using GPS, the app provides comprehensive information for visitors on what they can see and do nearby, while the augmented reality facility helps them identify landmarks and hills – all of Scotland’s Munros and Corbetts are included. The app also enables visitors to plan ahead and search for and book accommodation by destination. Alan Bird, project director, comments: “One of the Welcome to Scotland app’s most valuable and unusual features is that all of its content and main map are preloaded. “This means visitors can access the information wherever they are with no internet connection being required. “As a Scottish travel app, this makes a huge difference because many of our most beautiful rural locations suffer from poor broadband and mobile data coverage. “It also enables visitors from abroad to use the app on the go without risking expensive roaming charges. David Hayes, managing director, added: “Through Landmark Press and our ‘Welcome’ bedroom folders and guides we have been at the forefront of information provision for Scotland’s tourism industry for well over 20 years. “With the huge increase in the use of smartphones, it made undoubted sense to develop an app that would act as a guide to Scotland and that would be fun and entertaining to use. “We have been fortunate to have worked for the last three years with the Edinburgh based digital agency Line UK. They have done a great job, as – more recently – have GeoGuides the app developers from Wicklow. “Developing the app will be an ongoing process. Landmark Press, www.landmark-press.com, based at Carrbridge, Inverness-shire, is part of the company that operates the Landmark Forest Adventure Park at Carrbridge, Inveraray Jail and the Edinburgh Camera Obscura. Landmark Press is the leading publishers of information for Scotland’s tourism industry, supplying ‘Welcome’ bedroom folders to virtually all the hotels, guest houses, B&Bs and self catering properties in Scotland. In addition each year they publish 2.2 million ‘Welcome to Scotland’ and ‘Welcome to Edinburgh’ guides in six different languages. GeoGuides is the leader in the provision of enterprise solutions based on Augmented Reality and Directional Search technologies. Using unique, patented and innovative technology the business is now working with companies within the Tourism, Publishing and Event Industries to make their valuable content mobile.